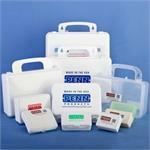 Our "Sample Pack" consists of an assortment of 11 different size cases (1 each). 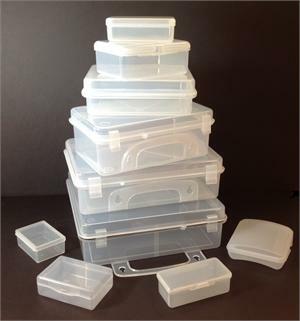 Perfect for use in evaluating sizes and styles for your packaging project! Typically they will be in translucent clear (as pictured), though at our discretion individual parts may be in a variety of colors and may include even include some level of customization, including optional gaskets or imprints. The eleven sizes included in the Sample Pack are Parts Case, Mini Case, Handy Pocket Case, Advantage Case, Contoured Pocket Case, Super Pocket Case, Travel Case, S10, N12, S16, and S24G.